For the 8th consecutive year, NOVA Employment (a not-for-profit disability employment agency funded by the Australian Government) is running the Focus on Ability Short Film Festival. The festival is free to enter and is aimed at raising awareness of the abilities of people with a disability. All films must have an ability/disability theme or be clearly identified as being made by a person with a disability. This means anyone in the world can enter, but do so before the deadline June 30th! The theme for the competition asks film makers to ‘Focus on the Ability’ of people with a disability. Video entries (Films) are to be maximum 5.00 minute duration, excluding credits. Any Films longer than 5.00 minutes will not be considered. Films meeting the entry requirements will be uploaded to NOVA’s website on the 27th July, 2016 and identified as entrants to the 2016 focusonability short film festivalOnline voting will commence 27th July, 2016 and cease midnight 8th August, 2016. All other prizes will be awarded by the judges. All winners will be contacted by email and results published on the NOVA website on September 11th, 2016. 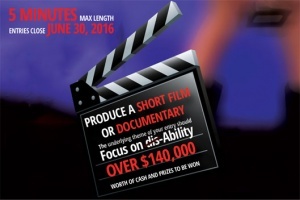 In 2009, CEO of NOVA Employment Martin Wren started the film Festival and by 2015 163 films were entered, and the winners shared in over $100,000 in prizes. The festival culminates in an awards night held in Sydney with 2016 dates set to be announced. Entrants will have the chance to feel like Scorsese and see their films premiered on the big screen as well as the chance to have their film shown on national television. 12 films were played live at the 2015 awards evening in front of a packed 700 person theatre. 10 films were screened across Australia’s free to air television station SBS. 60 films will air on pay television station Aurora TV across December 2015 and January 2016. The 2015 festival also held screenings in New York and Auckland, with many more screenings planned for the 2016 festival. The audience capacity for this festival is well over the 1,000,000 people mark and continuing to grow. Providing unmatched exposure for upcoming film makers. Films will be both judged by a professional judging panel and put through an online voting process, with separate prizes for each category. Next Article Part 3 – Women with Disabilities: How Accessible is the Road to Motherhood? Hey Buddy!, I found this information for you: "Australia Hosts Worldwide “Focus On Ability” Short Film Festival". Here is the website link: https://pushliving.com/australia-hosts-worldwide-focus-on-ability-short-film-festival/. Thank you.